The paradrake is meant to represent the larger mayflies like the ‘hex’, and the green and brown drakes. While the paradrake can be fished on still water where you sometimes find hatches of Hexagenia limbata and Ephemera vulgata, it’s a very buoyant fly that works in almost any flow. The pattern sits with the body on or in the meniscus and can often induce a strike where a heavier dressed pattern is ignored. The version illustrated is great for hatches of European mayflies, Ephemera danica, Ephemera vulgata, and the North American mayfly, Hexagenia limbata. Size is chosen to match the hatch while colour should be altered similarly. Brown dyed elk, for instance, would produce a good imitation of New Zealand’s larger mayflies,Ichthybotus hudsoni and Oniscigaster distans. 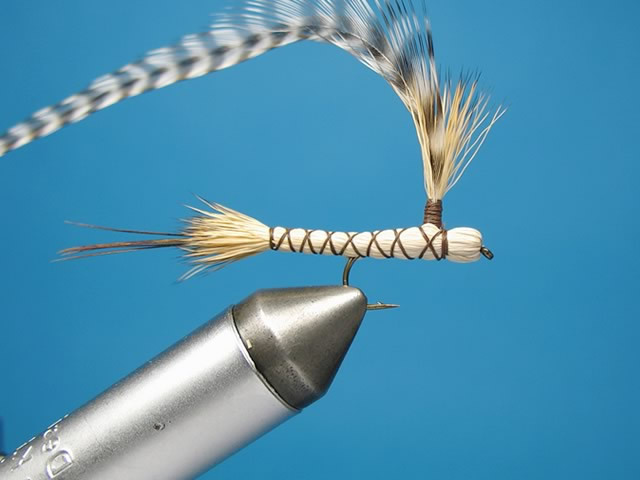 Present the paradrake using standard dry fly tactics, mostly maintaining a drag free drift. 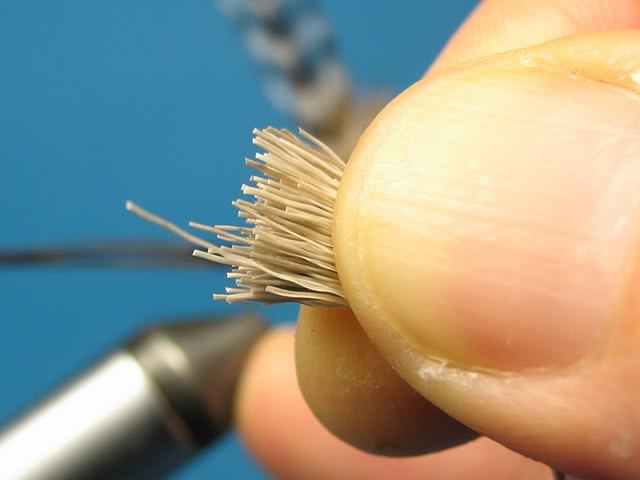 In a previous article Andrew Petherick suggests giving the rod a wiggle to impart movement to the fly during the drift. Emulating the motion of the dun struggling in the surface film this technique can bring a strike on those occasions where an otherwise faultless drift has drawn a blank. 1. Start the thread just passed the centre of the hook shank toward the bend. You can use Size A rod whipping thread for this. Wrap toward the bend to form a bed of thread and make one wrap back toward the hook eye. Let the thread bobbin hang. 2. Take a stacked bundle of elk hair about one to one and a half times the thickness of one matchstick. Holding it on the nearside of the hook, tips pointing about 30 degrees down, make one loose wrap around the hair and while holding the hair in place pull the thread tight. The hair will spin partially round the shank. 3. 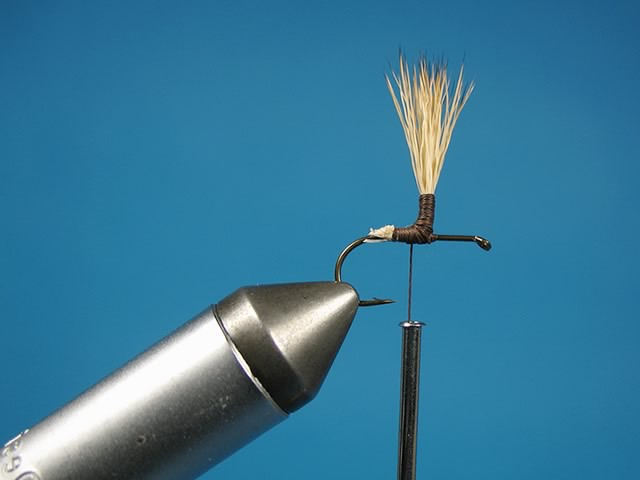 Keep the thread in tension and wrap the thread toward the hook eye in further tight turns, stopping short of the bare shank. Cut away the waste butts of hair with a tapering cut. 4. Gather and lift the elk hair to form a wing post. To avoid flaring the hair start the wraps tight and apply less tension for the last one or two wraps at the furthest point as you wrap away from the hook – apply increasing tension as you wrap back toward the hook. 5. 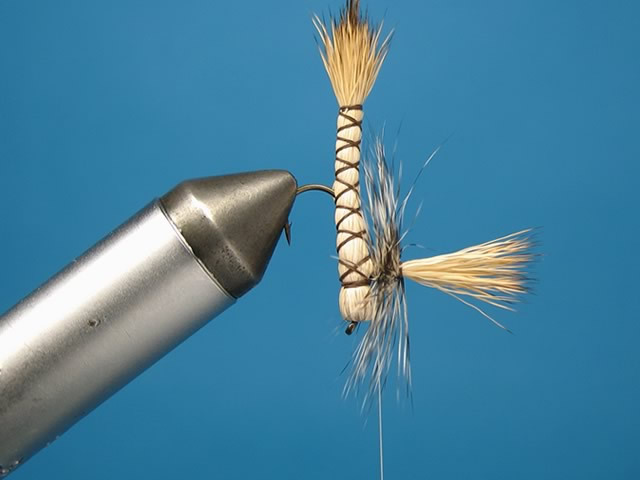 Tie in tail material, either pheasant tail or moose hair, long enough that when the body is trimmed it leaves tails of length equal to that of the body. 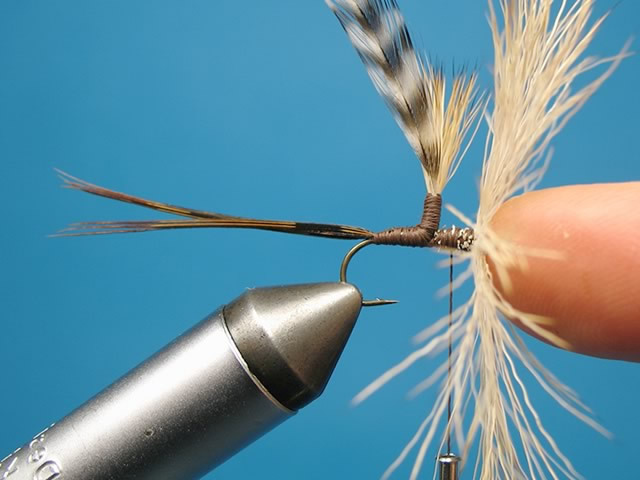 Then prepare and tie in a hackle having barbs the length of the hook. 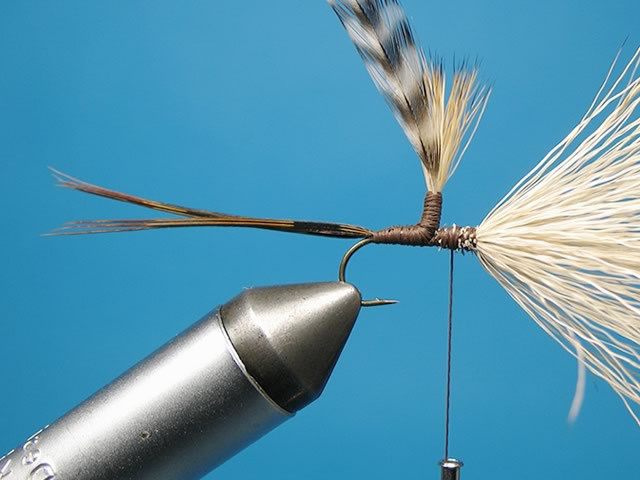 The hackle should be tied in on the wing post as illustrated having the concaved face of the feather toward you. 6. Take the thread to a point two or three wraps short of the hook eye. Take another bundle of stacked elk hair equivalent to approximately four or five matchsticks thickness. Hold the hair close to the ends as illustrated. 7. Cut the butts even and offer up to the hook where the thread hangs. 8. Make a couple loose wraps around the hair then pull the thread tight to spin the body material. 9. 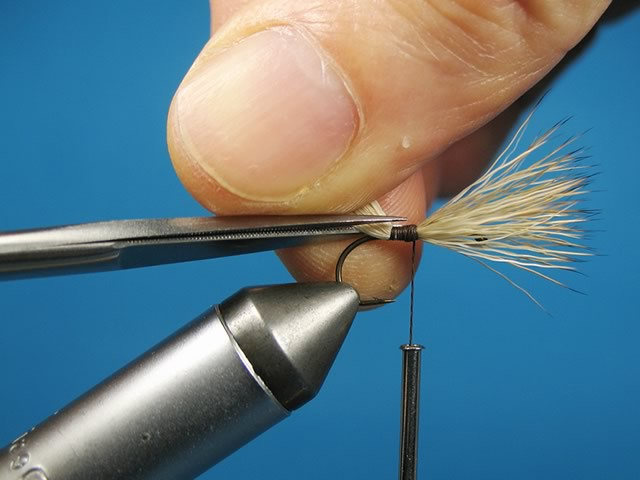 Bind the butts of elk hair and let the thread hang down two thirds of the way between the elk hair and the wing post. 10. 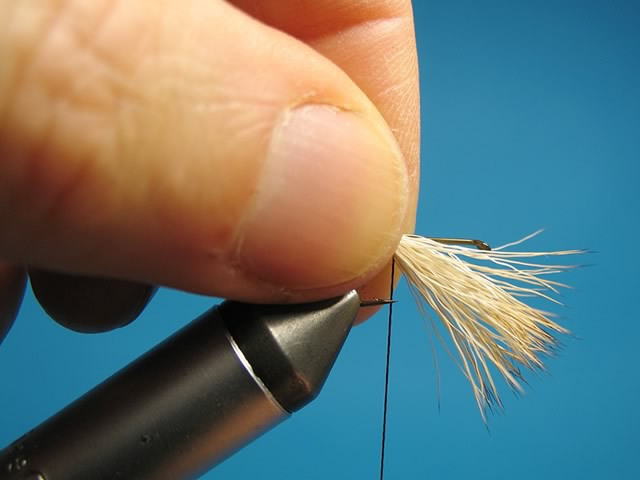 By pressing your finger to the hook eye, fan out the elk hair like a hackle collar. 11. Stroke and pull the elk hair back around the hook shank and make one wrap of thread around the hair in front of the wing post. Then wrap the thread in a tight open spiral toward the tail. 12. Take the thread passed the bend of the hook to form the extended body and cross wrap the thread back to the front of the body and make a whip finish. 13. 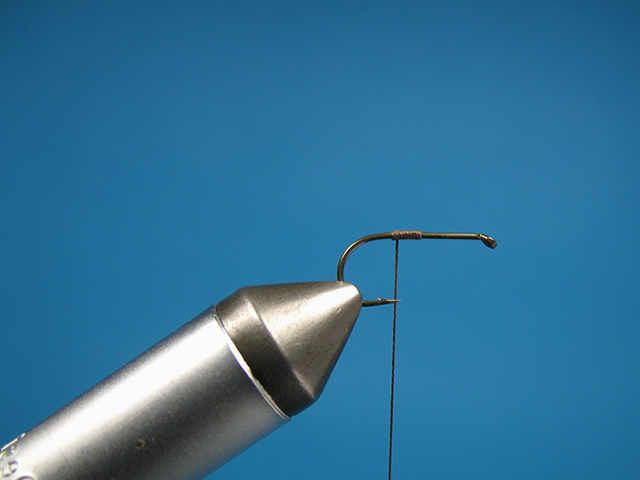 Turn the hook in the vice and start new thread such as Spiderweb or Dyneema around the wing post. Let the thread hang at the base of the post. 14. 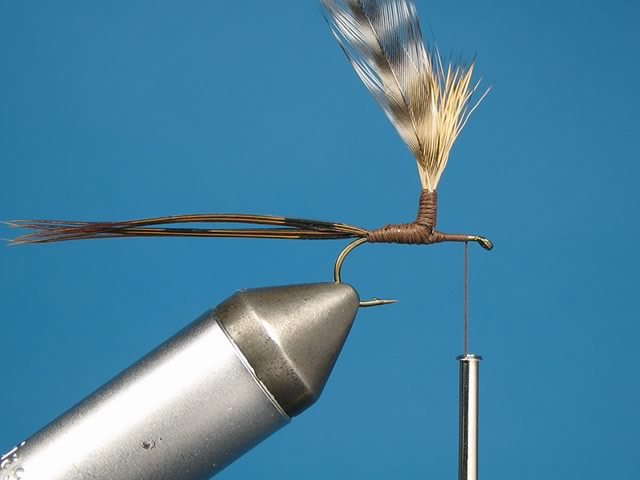 Make three or four wraps of hackle and tie off around the wing post. 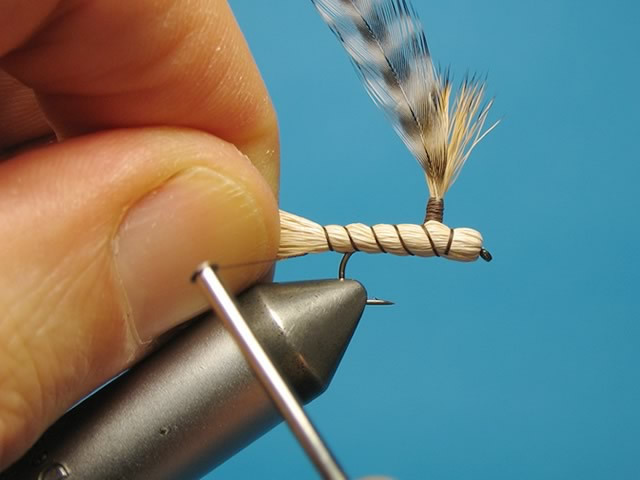 Make a whip finish under the hackle around the post. 15. Add a drop of head cement to the whip finish at the base of the wing post. 16. 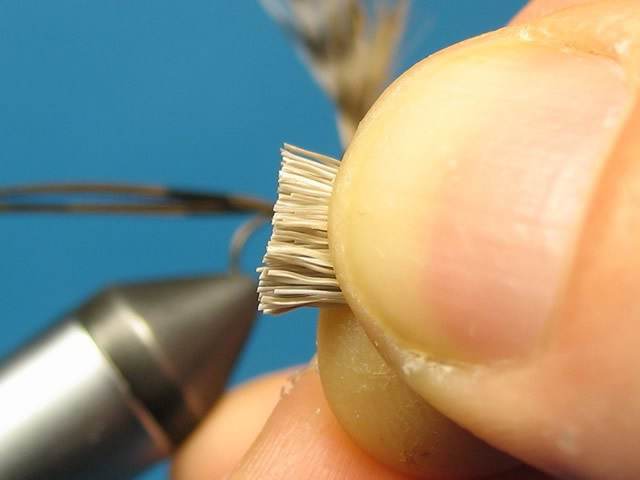 Trim the tips of elk hair at the tail end of the body and trim away excess tail filaments. I leave three tails like the natural, though it’s doubtful the fish would mind if there were a few extra!? For durability I treat the body with Dave’s Fleximent. Doug Swisher & Carl Richards developed the original paradrake, but the style illustrated was, according to Skip Morris, made popular by Mike Lawson. In Lawson's pattern, the hair for the body is tied in projecting forward at the head, before being pulled back 'bullet‑head' fashion. 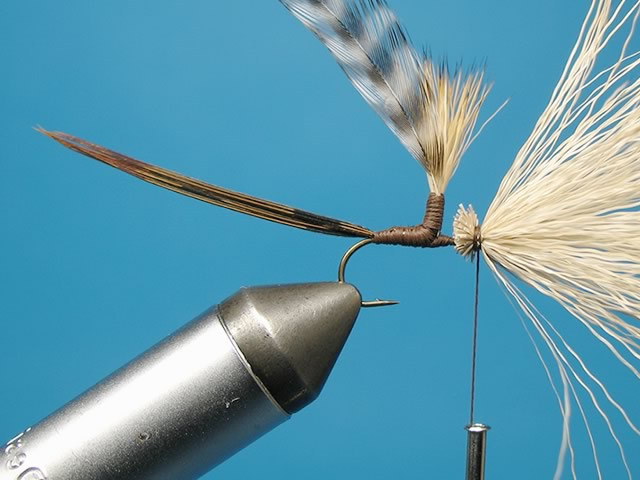 The original patterns outlined in Swisher & Richards' Selective Trout had the hair tied projecting straight back omitting the 'bullet‑head' technique. 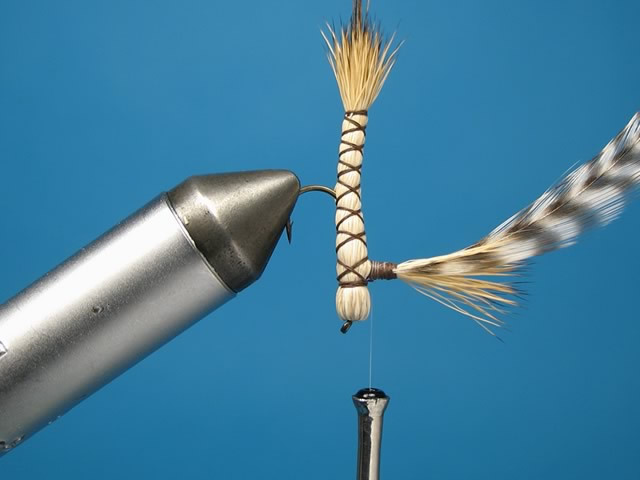 An alternative to tying the body using either of these techniques is to dress the body separately on a needle and to fix it to the hook later. 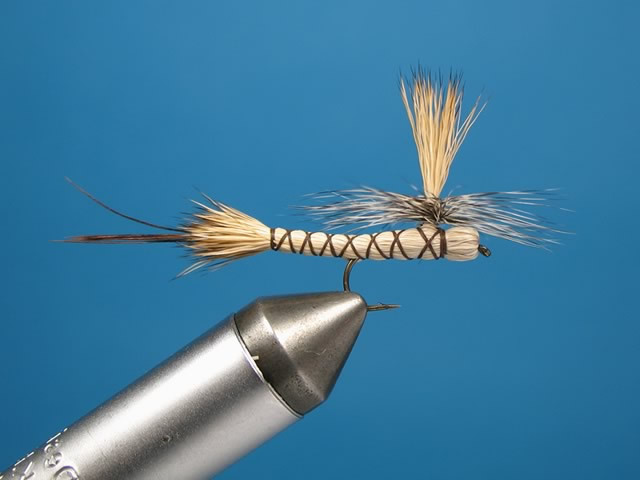 You'll find this method outlined here in the tying section . 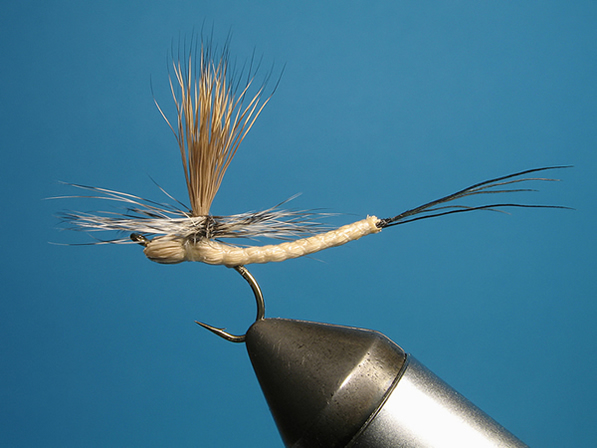 I often tie a slimmer paradrake dressed on a Drennan Sedge hook. This may be a confidence thing - it's definitely personal preference - I reckon the fish prefer it and tied this way I convert more strikes into hook-ups. Anyway, if you want to go with the original style stick with the step-by-step illustrated. Selective Trout, 1971, (2nd Edition, 2000) Doug Swisher and Carl Richards. Mayflies, 1997, Malcolm Knopp and Robert Cormier.